IIM Amritsar would be conducting its first convocation on 22nd April 2017. 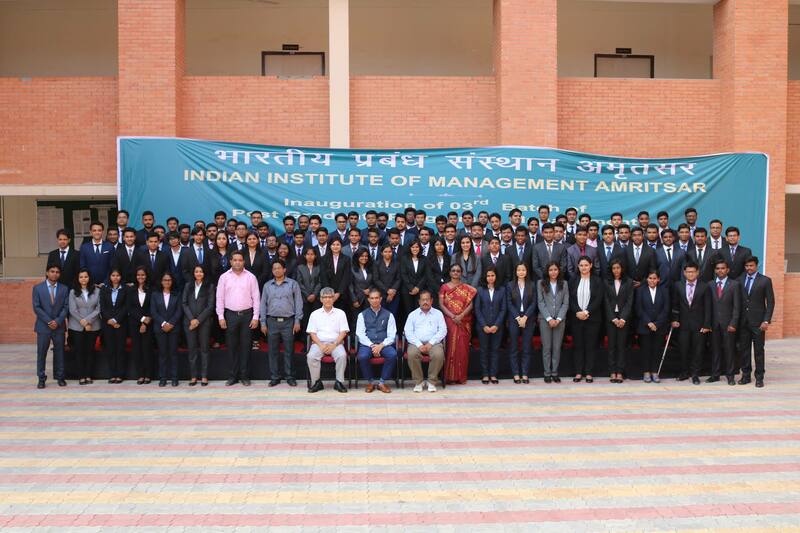 IIM Amritsar is the 15th IIM set up by MHRD in 2015 under the mentorship of IIM Kozhikode along with 5 other IIMs. The students of the pioneer batch (2015-17) of the premier institute would be receiving their diplomas for the Post Graduate Programme, PGP during the convocation ceremony. The venue for the event would be PIT, Inside Government Polytechnic College, Amritsar from where IIM Amritsar is currently operating. Shri. Bibek Debroy, Member, NITI Aayog and a world renowned Economist would be gracing the event with his presence as the Chief Guest of Honour and would be delivering the convocation address. Mr. Debroy has been a Professor at Centre for Policy Research, New Delhi since March 2007. He has also been an Honorary Senior Research Fellow at the Institute for South Asian Studies in National University of Singapore from March 2009. Since its day zero, Mr. Debroy has been a Member of NITI Aayog. As the head of the panel of restructuring railways, Mr. Debroy brought out a final report seeking to appoint an independent regulator while doing away with Rail Budget altogether. He was also conferred with Padma Shri award by President Pranab Mukherjee, in 2015 for his exemplary service. The maiden batch PGP 01 (2015-17) of IIM Amritsar, starting with a batch size of 44 in August 2015, has performed phenomenally well. Not just in the academic arena, but the students have also been active in identifying the problems plaguing the region of Punjab and have also been at the forefront in resolving them. As a part of an initiative taken by the CSR club of the institute – “Sankalp”, students had conducted a drug awareness camp at a government school near border areas. Also as a part of “Akshardaan” – a student-led drive, students went to Central Khalsa Orphanage in the city to teach and guide the children there so as to percolate the benefits of education to the grassroot levels. In addition to it, in its first two years of existence itself, IIM Amritsar has been able to foster a robust Industry-Academia relationship and has conducted three Management conclaves – “Asquare”, “Yukti” and “Sankshetra” in which industry leaders from the top echelons of the business world with the likes of Top Management professionals from Godrej, Polaris, Deutsche Bank, Holiday IQ, KPMG, Leo Burnett, Accenture, Philips etc marking their presence. Without a doubt, the first two batches have laid a strong foundation for the upcoming batches to build on to the legacy of the institute and the brand IIM. In the years to come, these students would definitely be looked upon as an epitome of leadership. It can also be seen that the corporate India has reaffirmed its trust in the institute and the same is reflected in the stellar summer and final placements at the institute. In last two years, IIM Kozhikode, the Mentor IIM offered an unwavering and strong support in terms of faculty and able mentorship to IIM Amritsar. While the past year was marked by turbulent times of Demonization and sporadic news casting doubts on the credibility of new IIMs, the summer and final placements at IIM Amritsar vanquishes any such apprehensions and stands as a testimony to the par excellence academic and industrial curriculum that has been set up by IIM Kozhikode. The report regarding the Final placements would be published in the next few days. In addition to it, in spite of an increase in the batch size, the second batch of 104 received multiple offers as 122 offers were made in total. It is to be noted that IIM Amritsar in its very second year of inception has been able to increase its intake by a whooping 133% to 105 from 45 in the first year and is the only IIM among the newest IIMs to increase its batch strength to more than 100. In addition to it, the average summer placement stipend stood at Rs. 49,780 and saw a 49.64% jump as compared to the previous year. The increase in the number of admissions indeed has dispelled the doubts in the minds whether new IIMs will be able to fill their seats.